The Cup Library is back for 2018! Did you know over a period of 12 months, UC sent approximately 400,000 single-use takeaway coffee cups to landfill? The best way to make sure you aren’t contributing to this problem is easy – either bring your own reusable cup, or borrow one of ours! 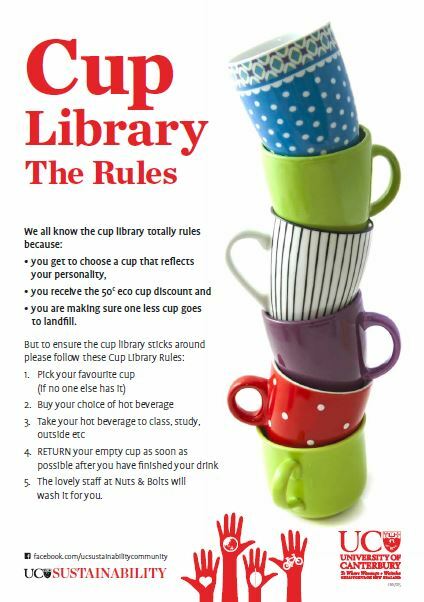 I’m sure many of you will fondly remember the Cup Library run by the Sustainability Office in 2017. Our Library took a break over summer, but it’s back for 2018 and ready to help you ditch those pesky single-use takeaway coffee cups once and for all! Find it at Nuts n Bolts Café in the Engineering Core, with your favourite cup ready to get you a 50c discount on your hot drink. Stay connected, and be in touch with us! Follow us on Facebook or Instagram, or check out our website for more information about what we do, and upcoming events.